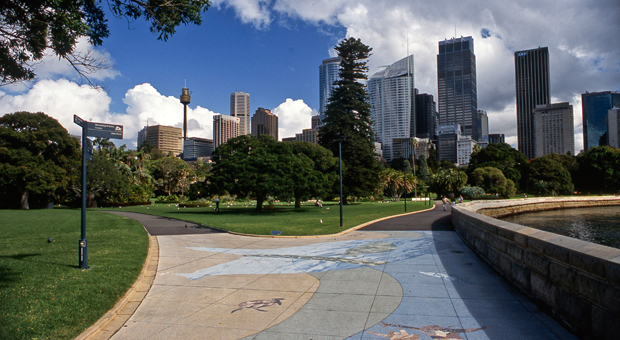 Woolloomooloo is the name given to the Yurong Creek valley located immediately east of Sydney Town and the Domain, which later became Sydney’s first suburb. 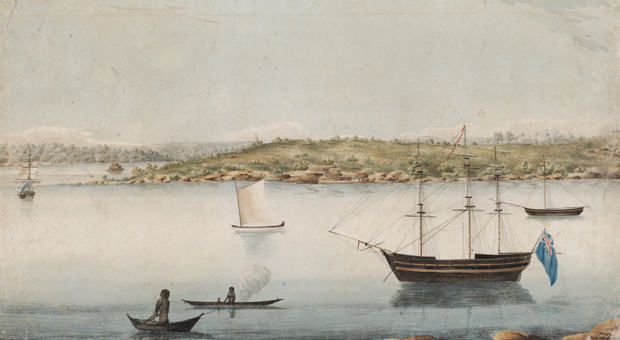 In 1793, when Commissary General John Palmer was granted 100 acres at Woolloomooloo, extending from Woolloomooloo Bay to Oxford Street, he also acknowledged this by naming his house Woollamoola after its Aboriginal name (also recorded as Waalamool, Walla-mool and Wallamoula). This later resulted in the suburb and bay being named Woolloomooloo. Palmer cultivated fruit trees and tobacco on his land in the 1810s. 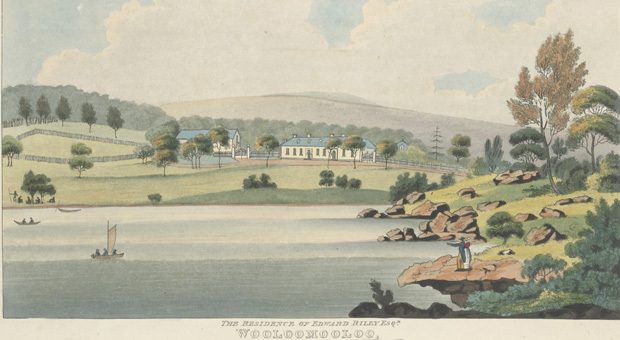 His house was occupied by later assistant commissaries, David Allan and Frederick Drennan, before he sold the estate to Edward Riley in 1822. 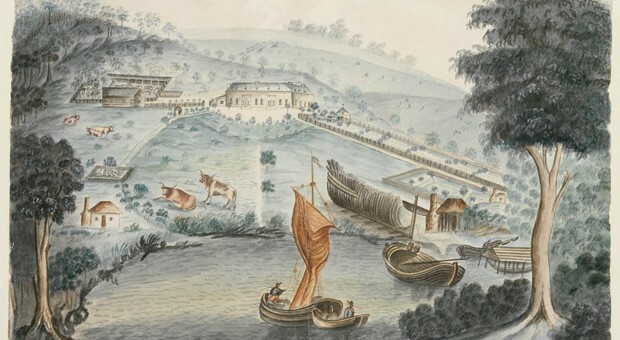 Throughout this time, Aboriginal people frequented the estate to camp, fish, hunt and conduct ceremony. They were often referred to as the ‘Woolloomooloo tribe’ in the 19th century, although they also moved around a much broader area. The land between Woollomoola House and the bay was ‘a favourite camping ground’ for Aboriginal people accessing the resources of the bay. 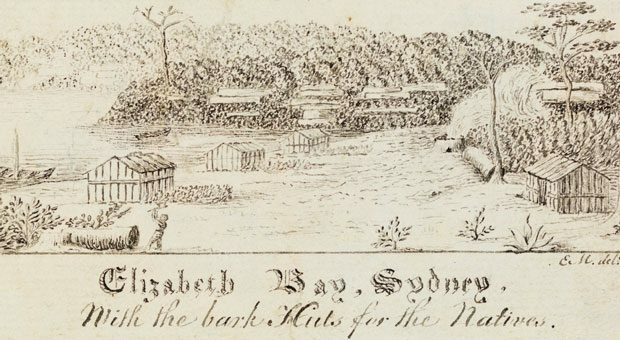 After payback contests in Hyde Park in the 1810s and 1820s to punish individuals for transgressions, Aboriginal people returned to camp at Woolloomooloo, where ‘fires were lit in all directions, and yarning and cracking jokes took place until nearly daylight.’ Others, such as Botany Bay man Mahroot, lived with David Allan at Woollomoola House in the 1810s. A “corrobbora” of the aborigines took place at Wooloomoolloo on Monday night.Young Bungaree did the honors of the ceremonies. Before the party broke up, his sable Majesty became done up with bull; and in consequence of some pranks played by him he was floored by a waddie, on which a regular melee ensued, the company espousing different sides of the question ; and after a hard fought battle they parted good friends, some of their cobberas having sustained considerable damage. 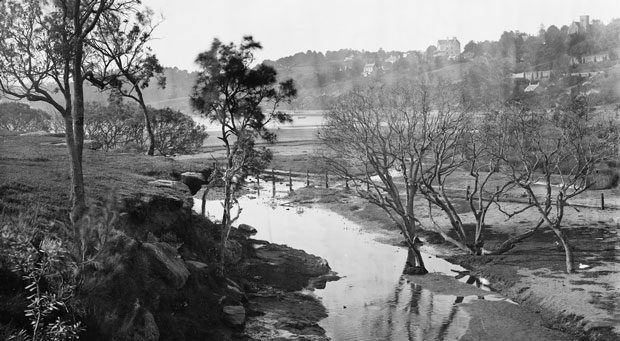 A young Obed West, growing up over the hill at Paddington in the early 19th century, recalled ‘seeing 200 or 300 of the original owners of the soil camped about the bay’, during ceremonies at Woolloomooloo. 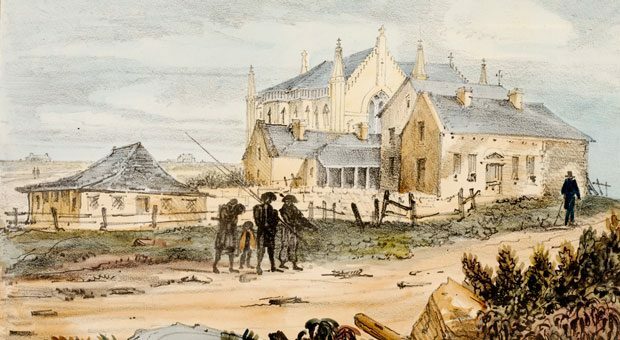 Aboriginal people continued to live around Woolloomooloo as Woolloomooloo Hill was divided up to house stately villas in the late 1820s and 1830s, and the valley became a residential suburb in the 1840s. 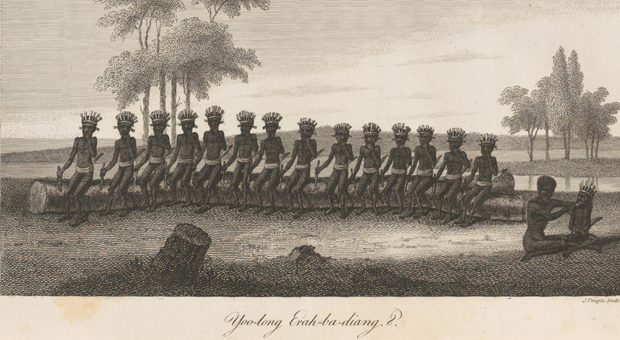 The ‘Woolloomooloo tribe’ attended a Christmas feast for Aboriginal people hosted by Sydney businessman Charles Smith at his home near the Sydney Markets in 1844, and in the 1850s one of their settlements was around where the current Cathedral Street (then Woolloomooloo Street) crossed Yurong Creek. By the 1860s, when the area was covered in housing and the shore had been replaced by a seawall and wharves, there do not appear to have been further Aboriginal settlements established. 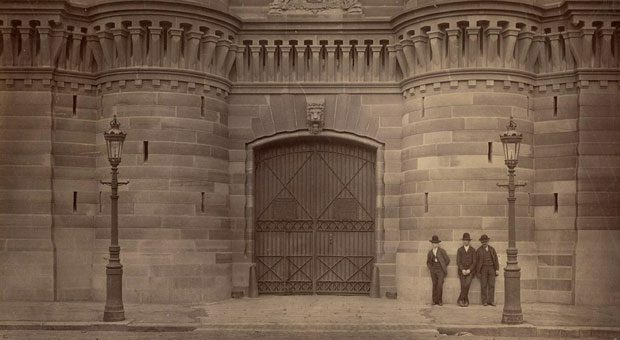 A few individuals are briefly mentioned at this time, sometimes living with sympathetic Europeans, and more are likely to have at least passed through the area on their way to town from other settlements to the east such as Rushcutters Bay and Barcom Glen. 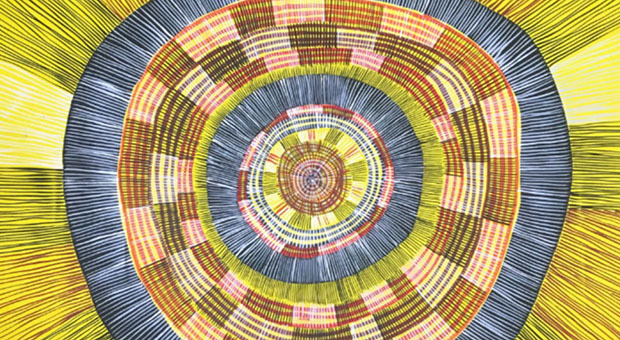 A century later in the 1970s and 1980s, Aboriginal and Torres Strait Islander people began moving into community housing at Woolloomooloo and formed a new community. There are currently around 100 indigenous people living in the area, and their stories are only beginning to be explored. 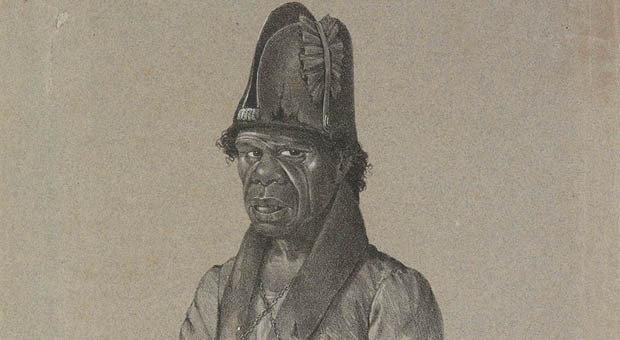 Keith Vincent Smith, King Bungaree: A Sydney Aborigine meets the great South Pacific explorers, 1799-1830 (Kenthurst, NSW: Kangaroo Press, 1992).